Daddi is a horizontal bar spinner with ABSOLUTELY nothing in common with Chewii. The chassis is made up of a single top and bottom plate as well as three aluminum side plates. 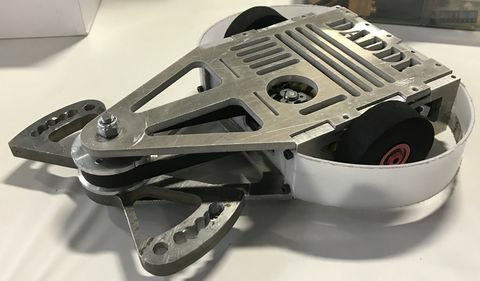 The front plate that protected the contents of our bot from our opponents (and ourselves) was made up of a plastic tab that fit in with slits. The weapon is currently a steel 'infinity' design, but was at one point a single-headed hammer with a dense counterweight. We had a ton of mentors throughout the manufacturing phase, but Rahul was the OG. We got propped against the corner and drive had issues getting us out of that situation. Weapon subsystem worked optimally. This win was a battle of attrition. We started with a functioning weapon but only one functioning wheel. The opponent started with no weapon and a weak drive. We got a judges victory because we were able to hobble over and smack them up a bit. We both got some good hits in, but it was ultimately down to losing a wheel and not being able to spin up the one wheel we did have. Drilled new holes for the new armor but those weren't used because we screwed up the drawing for where the holes were place and how large the plastic was supposed to be. This page was last edited on 4 April 2019, at 19:11.